Here's a couple I did today...they need to spruce up! Kat I love the containers you have. I have looked at the heads but have never seen any of the others you have for sale. Is there a web listing for them also? Veronica...just click on the side panel of this page -Stoneface Creations. I am so happy with the Caladiums this year. I've been poking a few into various containers and it's just an added bonus when they decide to show themselves. Here's my front planters with Cherokee frills Coleus which is doing exactly what I wanted them to do, as well as "Florida Sweetheart" caladiums. They're just starting to come up and are so ruffly and pretty. I keep planting these pots around the Lemon-Lime cordyline, which just seems to do so well in the shade. I may move them soon, but for now they're okay. This is a new variety for me...Florida Fantasy! And, they can handle sun! I've got a bunch planted in this pot with the Sunpatience (which are actually doing well this year). Can't wait to see them all come up! I need to figure out which of the Caladiums do well in the sun. I really like them! Hetty, if you go to http://www.caladiumbulbs4less.com/servlet/the-All-Varieties/... and scroll down to almost the bottom of the catagories on the left side, you will see Sun Tolerant. He has a nice selection of them. Kat, beautiful as usual. Such inspiration.! Hetty...I've been trying to pick out the most sun tolerant varieties. 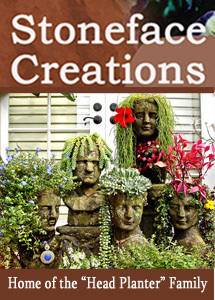 I got mine from Bill at Caladiums4less and Debbies right...he has them catagorized. That white variety above is supposed to be sun tolerant and is gorgeous! Kat, did you know about the semp, sedum co op that mama reopened? http://cubits.org/notfortheserious/thread/view/23026/ I know you where working on a wire figure of some kind. Also, Have you been to the http://www.topiaryartworks.com/livingwreath.html yet? Mercy, we can make containers that look like balls. http://www.topiaryartworks.com/sphagmoshanb1.html Somebody, hide my check book? Debbie: I checked it out and it looks great...however, looks like they've maybe reached their quota's. I'm really not too familiar with co-ops, can you please explain a little on how they work? What is the minimum/maximum amount? Love the topiaryartworks site too! Thanks for posting it. Hetty...I'm loving these "Florida Sweethearts" today even more! These ones I put out in the front entrance 3 years ago...for some reason they've come up even better this 3rd year. Dwarf's don't stay dwarf's either. I also really like "Galaxy". They also do well for me in sun. These I think are my favorites - Florida Beauty. They're really hard to find though and I did get some from Caladiums4less this year. They haven't come up yet but I sure hope they're the same variety. Miss Muffets are cute too...they did well in the cage in pots. LOL Kat, I am lusting after your plant combo's. Prettiest thing I've ever seen girl. You are indeed an artist. we,collectively, as a group, have to order at least 3 trays to get the best price. Three trays being a tray of sedum, a tray of semps, and a tray of the hueff's. Or any combination thereof, as long as it is three trays or more. On a tray of semps, for example, the co op can get 12 different varieties , but each variety must be in multiples of 7's. 12 x 7 = 84. Their are 84 to a tray. Sooooooo, if you go down the spreadsheet list, you can see which ones still need some more ordered to reach the counts of 7. If 4 have sold, you are able to order 3 and that will bring it up to 7. If 12 have sold, then you can order 2 more to bring it up to 14. It's really easy. Also, you can order 7 of whatever you want and know you will probably get them. But, you can also just order what you want in the quantity you want. Then just make a post saying , "I would like to order.............." and at the end of the co op, anything that didn't reach a multiple of 7 or a full tray of 12 set of 7 , will be dropped. Please come over and join us. It's fun as we all try to work together to meet the minimums. Kat, I had to forward your Lemon-Lime cordyline combo to a fellow gardener it was soooo striking. I have exceeded my plant budget for the year and saw Lemon-Lime cordyline at Walmart today for $10. It was everything I could do to hold back. Maybe next year. This Teacup Elephant Ear combo will not survive my winter either. It's been raining so hard, just had to place the plants and wait for a sunny day. This one I'm going to pass on as I ordered some wholesale from North Hills Nursery and didn't have to think too much. Will definitely keep an eye on the co-op though. Looks great. That is a really pretty combo Susan. I love the Teacup elephant ear...I haven't seen them around here. Are the orange flowers Begonia's? Very, very, nice!